Build on your basic stained glass making skills. 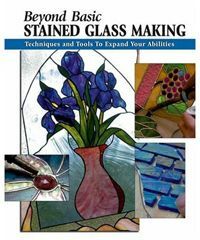 With straightforward text and color photos, this book shows you how to master more advanced stained glass making techniques. Step-by-step instructions for creating tabletop box, large hanging lampshade, and a decorative mosaic - along with a host of expert advice on how to improve stained glass making skills. Includes: Step-by-step instructions & a host of expert advice.